3D models can be used by product designers to produce product visuals or 3D renderings of product designs. This enables the product designers and their clients to see what the product would look like in a variety of different colours, materials and textures and even to view the product in its intended environment before the product is actually made. If the 3D product visuals are rendered still as illustrations it is a good idea to accompany them with text to show what the product actually does. In this example the modeller has used 3D software to make a model of a particular product in use in its intended environment. 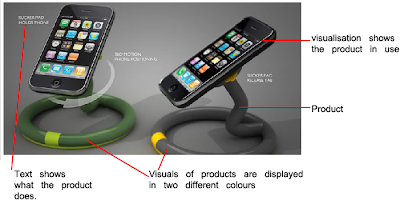 These product visuals have been rendered in several colours to show the product designer and their client how there product could/will look when manufactured. This still image of the product has also been accompanied with text to explain what the product does in more detail.